They say that if you look at the Earth from space, there are two things that are clearly visible: one is the Great Wall of China; the other is Kristin Berardi’s smile. It is a big, radiant, generous, heartwarming smile full of teeth and hope; a smile that makes all worries go away and reassures you that things will be alright, no matter what. And this is not even her most prominent feature. That should be her voice – equally warm, sweet, seducing and reassuring, a voice that embraces you and caresses you and makes you happy – a voice like salted caramel and Sunday afternoons. 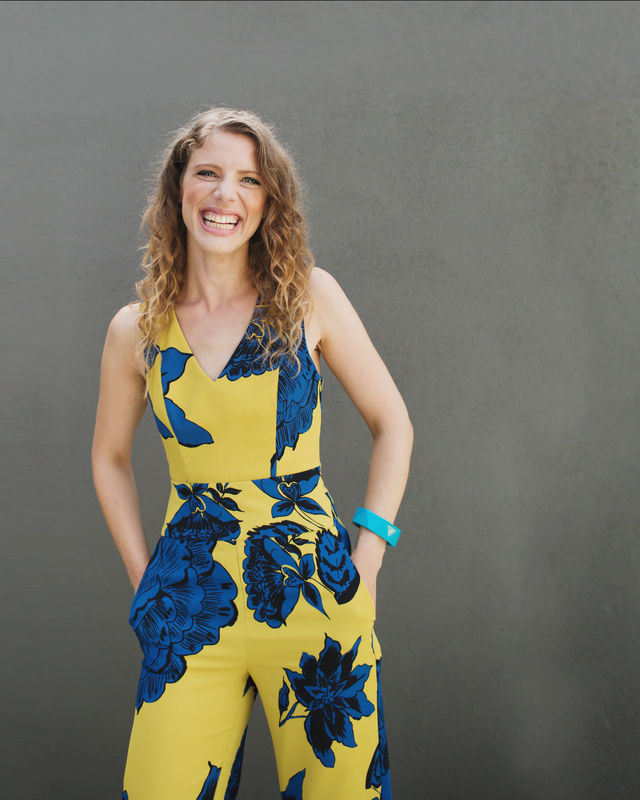 Kristin Berardi knows how to use that voice; her impeccable phrasing – she weighs in every syllable she sings, swirling it in her mouth before she actually lets it out – has made her one of the best singers in the Australian jazz community. Not to mention that she has also composed a few songs that should be recognized as modern standards. Now she has a new album out – a year after she released two albums, “Where or When” (which got her a nomination for a Jazz Bell Award) and “Hope in My Pocket”, an ambitious project of her trio with Sean Foran and Rafael Karlen – and she’s touring around the country to make it known. Which is all the excuse needed to chat with her. AustralianJazz.Net: How would you describe “Just as you are”? How does it stand as a follow-up to “Where or When”? Kristin Berardi: “Just As You Are” was basically a result of feeling like the band and I had got these tunes to a certain point and wanting to capture that. It was actually recorded before “Where Or When”, but I guess the biggest difference is that this album has drums in the line up, and is mostly my compositions. Also, how the songs are presented on this album are how I envisaged them to be when I wrote them. Some of these songs have been recorded before in different settings, for example “Ode To Oli”, but this is the vehicle I wrote it for – double bass and voice. AJN: How did you decide on the covers you wanted to include? KB: I just pick songs I love to listen to, and I love to sing. AJN: Have you felt that you are not ready, at a given moment, to sing a certain song, and had to wait? KB: Yes; sometimes I have felt I’m either not the right age or haven’t had certain life experiences to warrant singing a certain song. Or now, with some of the songs, I feel like I’d be too old! “Blame it on my youth” for example. I think I’ve missed that boat! AJN: Do you need to feel an emotional connection to it, before you decide to include it in your repertoire? KB: I always have to have an emotional connection to the song, otherwise I don’t feel I’ll be able to do a good job. I’ve never been good at pretending, so it has to be honest and real. AJN: How do you get to writing your own songs? KB: Writing happens in different ways now – which I’ve come to accept – so sometimes it will all come at once (words/melody/harmony) and sometimes in stages. My songs mainly come through me processing what is going on for me personally, or for others, or just the world around me. Just taking the time to ponder, think about a situation, a conversation or a person and exploring musically. I write at the piano, but sometimes the ideas will come away from that too. Thank goodness for “voice memo” on my phone! AJN: When did you realize the power of your voice? KB: It wasn’t me who realised at first… it was my Year 8 music teacher. She gave me the solo for the choir end of year performance, and I thought nothing of it. She had heard something in me that I didn’t know was special. I’ve always been so thankful to Miss Hardwick for noticing that musical gift. I was focused on classical violin then, so it was a surprise to me that my voice and how I sang a song was anything note worthy. AJN: This has been a couple of very prolific years for you. How do you tackle all the various projects that you have been working on? KB: It has been a busy year and I’ve been enjoying the different projects that have been happening, and writing or arranging for the different ensembles. I have a book that I have dedicated to just writing plans, or ideas for the different groups I’m in, which has been helpful. I find just getting it all on paper helps me process it and not feel overwhelmed by it all. Listening to music and photography really inspires me. Also, getting out into nature is really helpful in feeling rested and calm, it’s just making the time for those things that is the challenge. AJN: The new album is out the moment that your previous one is nominated for the Australian Jazz Bell Awards. How does this feel? KB: It is very encouraging when you get feedback that people like your music. The reason I make music is to hopefully move people. Sometimes people will share with you that the music indeed does that, and sometimes you may have no idea, so it’s been wonderful to be nominated for this and to feel like some people have been touched by the music. AJN: What has been the highlight of your career so far? KB: One thing that stands out in my mind is when James Sherlock and I were performing at The Montreux Jazz Festival, supporting Al Jarreau and George Benson, and I could hear people cheering us on in the wings. Knowing that we knew no one there personally, I glanced to the side of stage to see who it possibly was, and it was Al Jarreau and some of his band. AJN: If you had not been a singer, what would you do? KB: I wanted to be a truck driver and a jazz singer when I was young, but if I lost my larynx now I would want to be a photographer. AJN: What is jazz to you? KB: Jazz is freedom. Freedom to be yourself. Freedom to explore. Freedom to improvise. Freedom to choose how you shape a song. Jazz is also joy. Sometimes on the gig, when you’re in the moment, listening and making music with people – reacting to one another, and just being a vessel to the music, I feel such joy. *On Friday 10 June, Kristin Berardi and her band will perform “Just as you are” at the 2016 Melbourne International Jazz Festival. Berardi really hit the nail on the head with her answer to, What is jazz to you? Jazz was born out of the freedom movement in the States. and you are sure right about her smile, it’s infectious. Pretty good voice too, me thinks a lot. What an amazing experience the The Montreux Jazz Festival must have been for her. I hope to make it one day. Thanks for this, made my day.